Be warned: goblin philosophy can be easily found offensive or evil to many people. So read these posts only if you are open to controversial ideas. BEWARE! This post will be much more "evil", than any previous. 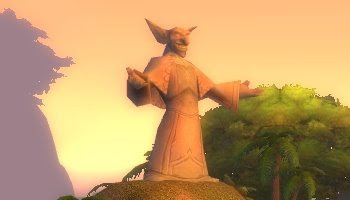 If you come here just to get tips on making WoW money, pick a post from the list on the top, and DON'T bother reading on! As WoW insider announced and we could see it, the zombies have disappeared. Not defeated by the players, not cured by the combined effort of the horde and alliance, NPC-s just disappeared, like never existed. No more plagued roaches, no more conspicious crates, no way to become zombie. I never liked zombies, as you could read from my previous posts. I killed them when I could, and tried to find ways (and tell it on forums and blogs) how to avoid them. Yet now here I am, delaying my previously written post and writing this in haste, without having breakfast. I slept very badly and I'm really upset with the recent events. Obviously I'm not mourning some game-zombies. I also won't miss the idiot-kids fun of abusing players. It is you dear readers, or at least big part of you that took my sleep. Blizzard definitely did not planned to remove zombies. They surely planned some new stage in the world event. For example cure is found and the players with a quest item can decurse the infected and end the plague. Or maybe they planned raids of Argent Dawn we could join to reclaim our cities. We'll never know. Yesterday I read blog posts like this and this and many others which I forgot to mark and it's too early and I'm to pissed to find them again. Please read not only the posts but also the comments. Their summary is: "QQ, zombies annoy me, QQ, I can't make my daily routine of banking, dailies, grinding, QQ, I will stop playing until it goes away, QQ". There were always QQ posts, usually "nerf [random class] because they are way OP", but this was different. People really stopped playing! Blizzard had to hotfix-nerf the zombies because legions of people decided to stop playing. I remember sunday evening (did not cared about it back then) when I was slaying the few dumb zombies who tried to invade Undercity, that trade and general chat were dead besides some whining about zombies. There were no "LF2M tank and healer to whatever" as it used to be. And I saw only a few players, mostly zombiekillers like myself. The AH was also empty. The server was deserted. We have a daily routine in the game, just like in real life. And sometimes some unexpected bad thing happens. Earthquake, traffic accident, fire, flooding, terrorist attack, infection, criminal's attack, being fired from job, your special one leaves you, relative or friend dies and so on. Crysis situations will come to the life of all of us. And we'll have to solve them. In this game we had a ridicolously easy crysis situation: some mindless kids tried to infect us. It was very easy to kill them if we had a decurser in group. It was very-very easy to avoid them since these brainless idiot kids attacked only frequented main cities, and maybe raided one town at a time. Yet huge amount of people failed to solve this situation and succumbed to futile emotions like anger or denial. Bad news punks: Blizzard cannot hotfix an earthquake! I've always seen on the TV-news from disasters that some people just sit on the ruins doing nothing at all. I thought that they are a handful of mentally weak (in medical sense) people and it's just the media that focuses on them, while 99.9% are digging for survivors or creating improvised shelters, or distributing the UN packages or fixing infrastucture. I could never imagine how could a handful of idiots armed with kitchen utensils capture airplanes against 200+ passengers to drive them into buildings on 9/11. I could never imagine how could a colonel with a couple hundred soldiers capture a whole country (I mean they have less bullets than citizens, they could be defeated unarmed). I understand it now. Most people are simply unable to cope with crysis situations. They just sit in apathy or whine to each other and do nothing at all. Those people who can do the very simple tasks of pulling someone out of the burning building or from the water, giving first aid, or shooting back are called heroes. I never understood why, I thought this is the normal behavior of the non-mentally-ill people. I had to face that it's not the case. The conclusion: if you couldn't handle the very weak zombies in this very simple simulated world, than you have no chance to stand up against a real crisis. Unless a "hero" comes along you will die with all your family. Edit: After 3 days my opinion about this event is less heated. I accept that lot of people didn't find the game he plays regularly important enough to protect it from zombies or at least try to evade them. I accept that it is not an unquestionable sign that the person is unable to cope with real life crisis situations. However I still find it a disturbing thing and definitely not a good sign. Honestly I'm not sure that the handling of the zombies really reflects how we'd act in a real life crises. So I wouldn't worry so much. When it comes to me the zombies wasn't fun at all, but since I was mostly occupied doing other stuff (raiding) I didn't suffer from it until I wanted to train my rogue. It sucked being killed over and over again and since I'm no pvp fan I couldn't enjoy taking part in the action at all. I wasn't so upset though that I could bother making a blog post about it. I think Blizzard easily could have avoided all the upset feelings if they had made it optional, so that you could tag yourself if you wanted or didn't want to take part of those games. But seriously my lack of enthusiasm for the zombie event in the game doesn't have anything to do with how I'd act in a real life crises. I'm definitly not someone just watching and wining. I'd do something. You get nothing for killing the goblins except for a repair-bill .. is that the goblin-way??? And seriously, just because I play a game for FUN (and this event is no fun) I'm not able to cope with real life issues? Now, I wasn't a huge fan of the zombies, but I did my part curing diseases. It was a great immersion event. However, Blizz DID say that it was scheduled to end yesterday, and in fact said LAST WEEK that it would end in "a few days." So it didn't end because of the QQ'ers. And really, saying that my ability to handle an in game event is a reflection of my ability to handle real life crises? Way overboard. I have a stepdaughter. If something happens, I'm picking her up and running. There's simply no motivation in WoW to prompt me to move as much as that little girl. WoW is a game, played for fun. Not a reflection of real life. Is it a reflection of how I would handle a real life scenario? Definitely not, In the real world events have occurred where I was tested I definitely didn't complain I did what was needed to do. In fact in WOW I was actively curing people in Orgrimmar and Thunder Bluff for a few hours but I wanted to get back to my regular gameplay also. I have a certain amount of time to play and I cherish that time. I do like the idea of the zombie invasion but I think it could have been handled better. For example if you received the disease you couldn't receive it again for x amount of time. Unfortunately, as in real life, you'll have people that purposely try to ruin other peoples lives and I saw that on my server. There are some people that only play a few hours weekly soI can see how they would be frustrated if they couldn't go about their normal questing within WOW. I helped a few of my low level guildies escape the cities. They had been killed repeatedly before I logged on so it wasn't like they could just leave. They tried that they kept dying. My low level toons (level seven and a level three) didn't stand a chance against the high level zombies, one swipe was all it took. Unlike real life if I see something that annoys me in WOW I can always move on to something else. The way I reacted in Wow (not that I posted about it) is very different than the way I in fact HAVE reacted to disasters and real life life threatning situations. I have lived along the southern cost of America and have been through more than one hurricane.I helped to rebuild. I have delt with situations where a few ran in while the rest ran out, and I was not headed away. Yet I found myself deciding to spend more time cleaning the garage than getting ganked by bored 12 year olds. Once it got past the 2 minute cooldown and most of the argent healers were gone it stopped being fun for me. Fun is why I play, if it's not fun I do something else. Real life does not come with the option to log off and come back in a few days. That being said, Blizzard definately put together an excellent world event that has certainly set the stage for more to come. I can't wait to see what they throw at us next. @everyone: I understand that a GAME is different than life and people could simply say "not worth doing it". I totally understand those CASUALS who did not log in. However most of you have blogs about this game, you play a lot so you take it pretty seriously. You accept it or not, it's an important part of your life. It is for me, that's for sure. For me it's not "just fun", it's an economical simulation, and in a lesser extent a life simulator (simulator =/= real). While the monsters and the gold are just data in a server, the actions of the other character are decided by a real human. However if someone wrote a QQ post or whined on the Blizzard forum, the situation was definitely more than "just a game". If it were just a stupid game, he'd simply not log in for a week. But you may be right and I overestimated the simulating accuracy of WoW. I'm glad to see however that most of you (I'm reading your blogs) have fought the zombies, decursed people. Gaming Diva: "My low level toons (level seven and a level three) didn't stand a chance against the high level zombies, one swipe was all it took." If one thing is common in WoW and real is that you always have a chance. My banker was just as small as yours and made it out from TB. When I logged in, I was instantly killed. I ressed at the spirit healer and walked down to Camp Taurajo. No zombies in the road. From Taurajo I flied to Orgrimmar (luckily I payed to a mage months ago for the flightpoint), as soon as I landed, I was killed by zombies. I ressed at the spirit healer again, ran to the zeppelin tower and flied to the safety to UC. And you know what: it felt really good that even with a lvl 7 banker the stupid kids cannot stop me. It's never without hope! The zombies on ZJ thought ahead after dying a few times I res'd at the spirt healer. Guess what was waiting for me? Yep, zombies...Thankfully I could log off and hop onto a higher toon to continue what I had to do but I did feel sorry for those people who only had their low level toons. I agree that this was a fun event, and that Blizzard shouldn't just cancel it due to player's crying about it (whether or not that's actually what happened, I don't know). But as joel said, what Blizzard did was the goblin thing to do - if continuing the event would alienate more people than discontinuing it, then you can bet they'll get rid of it since they're in it for the money. On the other hand, as you have pointed out several times in the past, anger is not a goblin emotion and doesn't really help anything. So why are you mad at this whole thing? Just take it easy - WoW is still the same economic simulation you paid to play that it was 2 weeks ago. @gaming diva: as a ghost you can walk to a different spirit healer. Not a short walk but can be done. @tal: you are absolutely right, and I kept banking during the event (as you can see it in my today's post). I have no doubt that Blizzard did the goblin thing and I did not say a bad word about them. I'm not disappointed in Blizzard, I'm disappointed in the players. However you are also right about being angry or disappointed in them does not change a thing. So I'm fully back to business. You would always rez at the original spirit healer even if you ran to a different one to ask be resurrected, or was on the wrong side of a cliff, and you could die from falling in ghost form. BGs were different in letting you run, because of the aoe rez. I guess it's still the same way.